At Miami University, there is intentional focus on activities that educate the entire campus community (both Tribal and non-Tribal students) about the Miami Tribe of Oklahoma and its history, culture, language, and contemporary conditions and issues. Programs are designed to understand the Tribe’s past while building a future together. Dispelling stereotypes about Native Americans is one of the major educational by-products of our ongoing relationship with the Miami Tribe. Playing traditional games (like lacrosse) and enjoying traditional foods. The Miami Tribe organized a joint visit of three chiefs whose tribes lived in the Ohio/Indiana area before the forced removals of the 1800s. Together, they were able to share different tribal perspectives and cultural activities. The Tribe’s cultural revitalization efforts include traditional games such as peekitahaminki (lacrosse), a Myaamia game that dates back to at least 1667, when records show Nicholas Perrot encountering the Miami people playing the game. Today, many Myaamia students enjoy playing peekitahaminki, usually with contemporary metal lacrosse sticks. Some students, however, prefer a traditional wooden lacrosse stick during Myaamia community games. One senior Myaamia student is even focusing his senior project on traditional wooden sticks. At Art After Dark, a Late Night Miami program, the Myaamia Center hosted a station where students could learn about the art form of peepankišaapiikahkia eehkwaatamenki (Myaamia ribbonwork). Miami students then created paper bookmarks inspired by the designs and process of Myaamia ribbonwork. Learning any language requires time and practice. On a biweekly basis, the Myaamia Center hosts a language table where Myaamia students eat together while learning about Myaamia language and culture. A place to ask questions, this also offers Myaamia students an opportunity to practice speaking the Myaamia language as they learn it. The Center also holds Myaamia language immersion sessions. Designed to allow Myaamia students to speak only Myaamia for several hours at a time, these sessions focus on day-to-day activities like cooking, eating, and playing games. Staff from the Myaamia Center regularly engage with the Miami University community through residence hall programs. Recently, at an event in Collins Hall, students in the Celebrate the Arts Living-Learning Community learned about peepankišaapiikahkia eehkwaatamenki (Myaamia ribbonwork) and created their own paper bookmarks. Every two years, the Myaamia Center hosts a day-long Myaamiaki Conference at Miami University. The Conference serves as a way to educate the Miami University and Miami Tribe communities about the research being completed at the Myaamia Center. University faculty, staff, and students attend the Conference, which also attracts Miami Tribe members from across the country. It is streamed online for those who cannot attend the conference in person. In addition to events on campus, Myaamia students and other Miami University students, faculty, and staff participate in Miami Tribe events held in Oklahoma. Through financial support from the College of Education, Health, and Society, the Myaamia Center charters a bus to Oklahoma for the Tribe's Winter Gathering. The gathering includes: aalhsoohkaana (Winter Stories), traditional Myaamia games, a culminating Stomp Dance (while stomp dances are ceremonial for many tribes, the Stomp Dance at the MTO Winter Gathering is a secular dance and participation is open to all attendees). Many Miami University faculty and students attend the Miami Tribe Annual Gathering, which occurs in June, each year. The Annual Gathering includes the following activities: a family day with games and friendly competition, a community-wide game of peekitahaminki (lacrosse), educational presentations, Tribal elections, and a two-night, MTO Pow Wow. The Miami Tribe and the Myaamia Center facilitate Eewansaapita, a summer educational experience for Myaamia youth ages 10-16. Each year, Myaamia Students from Miami University travel to Oklahoma and Indiana to serve as camp counselors. 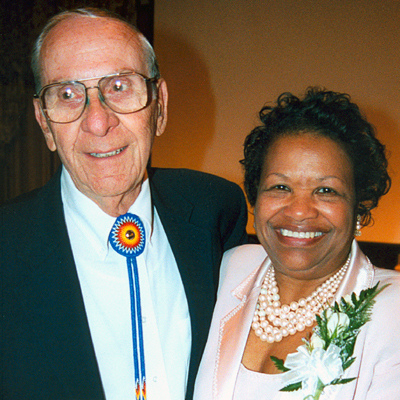 The roots of many of the current educational activities stem from a visit to Miami, Oklahoma in May of 1991 by Dr. Myrtis Powell (VP for Student Affairs 1989–2002). Invite Miami University students and faculty to visit Oklahoma to experience contemporary Native American life first-hand. Educate Miami University students, either in written form or via programs, about the contemporary Miami Tribe—people who are not warriors or do not appear in regalia and feathers and ride horses in daily life. Find a place on campus to display information about the history of the Miami Tribe, significant Native artifacts, and the University's connection with the Tribe. Beginning in 1991, the first on-campus activities focused on educating about the Miami Tribe. President Paul Pearson hosted a reception for Chief Leonard and several other guests from Oklahoma in November to showcase a new Native exhibit, created with the help of Chief Leonard, on display in the Shriver Center. A major component of the exhibit was a buckskin dress, donated to the University by Sharon Burkybile (the first Tribe liaison to Miami University) to honor her son, Scott, who was one of the first Myaamia students to enroll at Miami University in 1991 (and the first to graduate with an undergraduate degree in 1995). The Shade Family Room is a celebration of Miami University's history and traditions. Different themes are represented on each of the eight-wall columns around the room. One column is devoted to the relationship between Miami University and the Miami Tribe of Oklahoma. Focusing on the phrase neepwaantiinki, or "learning from each other," several photos and accompanying text show leaders, students, and faculty who have played an integral part in the development of this relationship since it began in 1972. The Wiikiaami Room, located on the second floor, offers another Armstrong location to learn about the Miami Tribe.